Down on the Black Sea, ex-president of Georgia Mikheil Saakasvhili is making waves as the new governor of Odessa. Is the balance of the Ukrainian state beginning to shift? During EuroMaidan, Yaroslav Hrytsak, one of Ukraine's most prominent public intellectuals, stated that the weight of the Ukrainian state after Maidan must shift. Long balanced between Lviv to the west and Kyiv in the centre, the state must 'go east': Ukrainian citizens, Hrytsak contended, will succeed in fundamental change only with three points of leverage. And at that moment, Dnipropetrovsk – Dnipro – was considered the most suitable candidate for the eastern outpost of this rebalancing project. Maidan has since been replaced by even greater upsets: the annexation of Crimea and war in the east. The south east is now a frontline. Although Russian involvement in fostering conflict in the Donbas is clear to the entire world, this involvement played on genuine, albeit passive, feelings of resentment in southern and eastern cities. Will President Poroshenko's recent appointment of Mikheil Saakasvhili, former president of Georgia, as the new governor of Odessa region address this resentment, and thus kickstart the twin projects of fighting corruption and decentralisation? And how will Dnipropetrovsk respond? With the rise of the separatist threat in Ukraine's south and east, Hrytsak's words turned out to be prophetic. But Dnipropetrovsk brushed off attempts by separatists to seize the local administration, and any manifestations of independence were snuffed out quickly, thanks partially to the (risky) decision to appoint oligarch Ihor Kolomoisky as governor of Dnipropetrovsk region. Indeed, in response to rumblings of separatism in neighbouring regions, Dnipropetrovsk saw an unprecedented outburst of patriotism. A volunteer movement began to take shape. And with the outbreak of armed conflict in the Donbas, the city found itself on the frontline. These fundamental changes, as well as the controversial figure of Kolomoisky and the eccentric behaviour of his team, have attracted attention – both foreign and domestic. For the first time in a while, the city began to feature on the front pages of European and American newspapers. Dnipropetrovsk was more than ready to play the new role of a southeastern outpost of Ukrainian statehood – a regional capital, that 'third point of leverage' as described by Hrytsak. But in the past 10-15 years, Dnipro's narcissism has taken a hit: from a city that used to think of itself, jokingly, 'not as the capital, but not the second city either,' Dnipropetrovsk has gradually turned into an ordinary provincial centre – young people, for instance, continue to flock to Kyiv. The decline of heavy industry and the inability to move into different industries, to shape a role befitting a modern city (rather than an old industrial centre and home to the remains of a once influential 'Dnipropetrovsk mafia'), have also taken their toll on Dnipropetrovsk's fortunes. Kolomoisky, it seems, was also ready for a 'Dnipropetrovsk renaissance'. There was talk of taking the rocket industry (still operating and still part of Dnipro identity) to a new level, developing hi-tech industries and, in general, transforming the city into a Ukrainian version of Silicon Valley. But given that Kolomoisky quickly found himself in open conflict with Poroshenko, we'll never know just how real that talk was. Kolomoisky's successor Ihor Reznichenko has not continued this rhetoric: the new governor of Dnipropetrovsk region is the complete opposite of his predecessor and, in general, avoids any rhetoric (as well as cameras and dictaphones) when possible. Regardless of the fact that the city continues to play an important role as a frontline town, the change of governor from an eccentric to a recluse has taken its toll on Dnipropetrovsk's visibility. The change of governor from an eccentric to a recluse has taken its toll on Dnipropetrovsk's visibility. Now, however, Dnipro residents have the chance to see their dream come true – only next door. After the appointment of Mikheil Saakashvili as governor of Odessa region, eyes are now fixed on this port city. Saakasvhili's appointment was presented as an attempt to put an end to corruption and the shadow economy: Odessa is, after all, Ukraine's largest port and thus the main conduit for smuggling, including drugs. The city is an arena for the illegal interests of all Ukraine's oligarchs, and stopping (or at least reducing) corruption in Odessa, particularly in customs and power ministries, will hit the oligarchs hard. Moreover, the reaction of Kolomoisky's 'team' to this appointment – the sharp status updates, a tendentious 1+1 TV 'documentary film' about Saakashvili's abuses in Georgia – suggests perhaps that the arrival of Saakashvili has hit one oligarch harder than the others. At least, that's the impression Kolomoisky and his team has been trying to create. Saakashvili is a far from one-sided figure – as the Russian media instantly reminded us. Indeed, the Russian reaction was just as stormy as Kolomoisky's. On the one hand, Saakashvili is undoubtedly a successful reformer: Georgia succeeds in terms of the ease of doing business, property and construction rights – in general, a good investment climate. Without a shadow of a doubt, Saakashvili managed to clean up everyday bribery in Georgia, making him a logical candidate for governor of a region defined by corruption. He was re-elected by the people of Georgia for a second term (a solid indicator of success), and was always a great admirer of Ukraine, to which Ukrainians have sought to respond in kind. On the other hand, the name of Saakashvili brings scandal to mind: the violent dispersal of peaceful protests; the far from transparent closing of opposition TV stations. Several of his decisions have garnered criticism from institutions such as Human Rights Watch. At one stage, there were even concerns that Georgia might turn into an authoritarian state. He left his native country as soon as he left the post of president, leaving behind several criminal cases opened against him (he calls them politically motivated). Georgia recently requested (and was refused) the extradition of the former president. Taking on Ukrainian citizenship should neutralise that risk. Regardless of what people say, legal maneuvres and violations of human rights don't quite overshadow Saakashvili's achievements as a reformer and fighter against corruption completely – the results are still to be seen today. Analysts in Ukraine are still wondering, though, why this 'glory' is being brought to bear now – for a real fight against corruption or a PR stunt? Several explanations have since emerged: either Saakashvili received the post because Poroshenko has set himself the task of ending the oligarchs' reign in Ukraine, or Saakashvili's real task is to allocate the kickbacks 'correctly' (that is, so only certain oligarchs suffer). Ultimately, we don’t know how realistic the second scenario might be: given how independent media have grown in the past 18 months, any 'selective treatment' will be noticed and likely become subject to investigation. Corruption schemes can only be built (and rebuilt) in indifferent societies, and Ukrainian society is no longer indifferent. In a responsive civil society, corruption becomes a risky art, and Ukraine's korruptsionery are clearly far from ready to learn the necessary skills. Instead, they nurture hope that everything has remained the same – just like after the last 'Revolution of Dignity' in 2004. Corruption schemes are built (and rebuilt) only in indifferent societies, and Ukrainian society has stopped being such. But there are indications that things will be different, and two recent events demonstrate that Saakasvhili, despite his 'local' post, is going to turn Ukrainian politics upside down on the national level. The first involves the now ex-prosecutor of Ivano-Frankivsk Region, Ihor Nastasyak. After a video of Saakashvili criticising Tetyana Hornostayeva, the deputy prosecutor of Odessa Region, went viral ('The interests of Hornostaieva are not the state's interests. This is called racketeering and banditism...'), Nastasyak, his feudal pride insulted, couldn't stop himself from boasting that the situation in Ivano-Frankivsk is very different. During a round table on social welfare for law enforcement employees, Nastasyak stated that he wouldn't allow the 'public shaming' of a prosecutor a la Saakashvili, and that the governor of Ivano-Frankivsk always consults him before doing 'something bold'. Indeed, Nastasyak described his relationship with the governor in precise terms: 'I say to him: this is how you need to do things, not like this – otherwise you'll end up as a client.' A few days later, Nastasyak was fired from his post. This was preceded by a status update by Saakashvili on Facebook, in which he inquired as to how long the General Prosecutor's Office was going to suffer these 'idiots' in the regions. The second incident, which was far less momentous but much more important, took place during a meeting of the Commission of the State Aviation Service. Saakashvili, in his usual emotional manner, accused Denys Antonyuk, the head of the service, of permitting only specific companies into the market. This practice has made the price of air tickets even more expensive (blindingly obvious to most Ukrainians), and is halting the development of domestic air travel. For instance, there is only one company operating air transport out of Dnipropetrovsk, MAU, which is under the control of Ihor Kolomoisky. The fact that low-cost airlines don't operate out of Dnipropetrovsk because it's not profitable for Kolomoisky isn't a secret to anyone. The day after the showdown at the commission, Poroshenko announced that, following a consultation with Saakashvili, a decision had been made to investigate Ukraine's aviation service and temporarily sideline Antonyuk as acting head of the service. This rant against public officials is only one in a series of videos capturing Saakashvili's emotional exchanges which have been appearing regularly since his appointment as governor. On the one hand, these videos suggest that the main aim of this project is to create a public image, to win people's sympathies and to create the illusion that everything is working efficiently as it should. Videos of Saakashvili's emotional exchanges with various public officials have appearred regularly since his appointment. 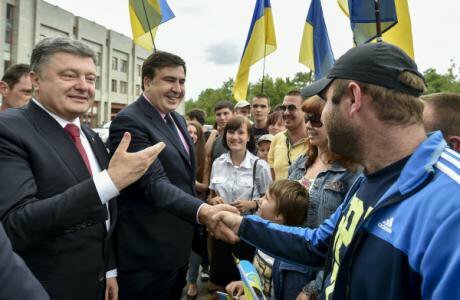 On the other, Poroshenko is using Saakashvili – an outsider without deep attachments to Ukrainian elites – as efficiently as possible; that is as another pair of hands to rake in the fire, which always breaks out in times of great change. Of course, the incident with the State Aviation Service can be seen as an attack on everyone's favourite figure of hate, Kolomoisky. Prior to taking up the top post at the aviation service, Antonyuk worked at MAU for 17 years, and has lobbied their interests since. By contrast, deputy prosecutor Hornostayeva isn't connected to Kolomoisky, but is connected by family ties to Viktor Shokin, the General Prosecutor of Ukraine. Ex-prosecutor Nastasyak isn't connected, it seems, to his own common sense. In a word, then, it's still too early to make conclusions about how serious are the plans to tackle corruption using Saakashvili (and his experience); we need to wait and see. Indeed, it's still too early to make a decision about whether Saakashvili's appointment is a sign that the south east's centre is being shifted to Odessa, rather than Dnipropetrovsk, where it began to take shape. Waiting for such a clear (and conscious) decision from Petro Poroshenko is, perhaps, too complimentary a view of his strategy to develop Ukrainian society. But whatever the intention behind it, the result might turn out to be exactly that. Of course, Odessa is no less suitable than Dnipropetrovsk for the role of 'capital of the south east'. 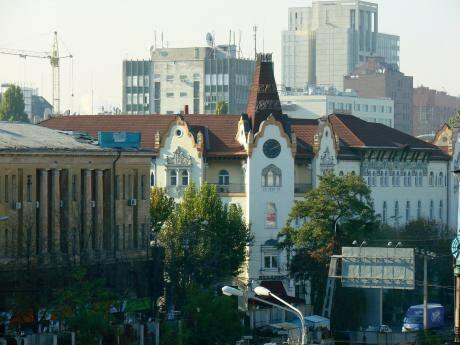 The city has shown resistance to separatist tendencies. It is a working cultural centre and plays an important role in the country's economy; the city even possesses a well-developed myth. However, transforming Odessa into a city, which 'isn't the capital, but not the second city either,' is a matter more of management than myth. In the end, if Odessa is to become the 'outpost of Ukrainian statehood' in the south east, then it would have a greater impact on dispelling anti-Ukrainian sentiment in the region than Dnipropetrovsk. Odessa has its own 'anti-Ukrainian' history, and has always positioned itself slightly askew of Ukraine during independence. Changing its course would curtail anti-Ukrainian feelings to an even greater extent. I'm not sure whether my fellow residents in Dnipro have noticed the competition we're facing, but I hope they will. And this is a good thing. The fact that two cities far from Kyiv, first Dnipropetrovsk, then Odessa, have attracted the media's attention gives one hope that decentralisation is happening – at least in our heads, if not yet on paper. What happens in our heads is far more important. And after all, competition is always good. The feeling that our elevated (but ambiguous) status is slipping through our fingers might prompt Dnipropetrovsk to find its own development strategies, our own myth – one unrelated to such a temporary figure as an eccentric governor. Perhaps this will lead to Ukraine gaining more centres of power – each with its own role, and all of them united within a modern European state.